In the last post, I promised that the ALERT software was almost ready to play with. Well, following on from the demos that we saw at the last ALERT meeting, one of the ALERT partners, The Jožef Stefan Institute in Slovenia, has set up a live demo of the ALERT user interface, populated with KDE data. I took the opportunity to record a quick overview of the UI (just under 10 minutes long) that briefly explores some of the main features. You might not see it on Planet KDE, but click through to the original post for the embedded video. The audio isn’t great – just a webcam, sorry – and you’ll notice that it is unscripted. I also at one point suggest there’s a non-working feature but in fact this was opening another window that I didn’t notice at the time. In the video, you’ll see how we can gather data from many sources (bug tracker, wiki, mailing lists, forum) and get recommendations for related issues and developers. There’s much more on offer, with advanced keyword searching – by person, code and much more, but I’ll come to those in future videos where I’ll concentrate on a particular aspect of the user interface. The original is in Ogg/Theora and I’ve requested that it should get uploaded on the ALERT website in the coming days (I’ll provide an update when that happens). In the meantime, does anyone know a video hosting service that enables everyone to download the original (i.e. free format) file? We used to use blip.tv quite a lot in KDE promo for that feature, but they no longer seem to accept ad-hoc videos. You can have a play with the demo yourself (keep in mind this is not the finished UI yet and not all functionality is present). And there is a more professional video already on the ALERT website. 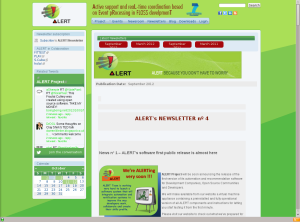 As always, you can track progress on the ALERT website, by signing up to the newsletter or via Twitter @alertfp7. Last week, as previously mentioned, we had an ALERT Project meeting in Paris, coupled with presenting ALERT at Open World Forum. The meeting itself was productive and we got to see the unified ALERT interface for the first time. This is a single web interface that brings together all of ALERT’s functionality, so that you can search for a bug, see related information from the forum, wiki, mailing list and source code repository. The interface seemed responsive and generally well thought-out – we gave some feedback to help improve it further in the final version. I also had some interesting discussions with Jesus from Libresoft about integrating parts of ALERT in existing systems such as Bugzilla. If we can get this working then it would be possible to have a list of suggested duplicate bugs on every bug report in Bugzilla – very useful for issue triage and to quickly identify new bug reports. Of course, the useful information could be more than possible duplicates – pointers to related discussions elsewhere or the relevant areas in the source code, for example. Part of Thursday and all of Friday was spent at the Open World Forum. We (Dario and I) gave a presentation on ALERT on Friday morning that gathered some interest (and some interesting questions) from those present. Overall, the conference was a bit strange – very corporate focussed, sponsored by Microsoft – but a worthwhile event nonetheless. I’ve just spent parts of the last few days testing out the install process for the ALERT components. It’s a modular system, with different parts developed by different partners in different languages (you can even run it distributed across several machines) so the installation is a bit fiddly. However, work is in progess in producing a virtual machine with all components pre-installed, which will simplify deployment a lot. We’ll be starting trials among KDE’s Solid developers in the next few weeks (targetting the end of October, but it depends when all the software components are ready for testing). I’ve just arrived at the latest ALERT meeting in Paris. Here, we’ll be working out the final details of testing the ALERT software within KDE (and the other partner organisations) to provide vital feedback for development in the final six months of the project. For more on ALERT, visit the project website or check my earlier posts. You can also follow ALERT on Twitter: @alertfp7. The ALERT Project, an EU funded collaborative project in which KDE is taking part as a partner has released its latest newsletter. In this issue, the main headline is the imminent test release of the ALERT software components, with some details of the capabilities of the software. There is also news about the ALERT Project workshop at Open World Forum in Paris next week (more on that in a few days) and at the fOSSa 2012 event later in the year. Finally, I also wrote a piece describing how we will go about the initial testing of the ALERT software in the end user communities (including KDE, where the first trials will be made in the context of the Solid project). If you’re wondering what ALERT is all about and how KDE is involved, check my previous posts on ALERT. ALERT is an EU funded project to provide tools to improve bug tracking (and general community monitoring) in free software communities. KDE is involved as a partner and Dario and myself are subcontracted to the project to provide input on the requirements of large free software organisations such as KDE. The project is now well into its second year and the software is starting to come together. A few demo videos of components in various states of readiness have been uploaded to the project website, but I particularly wanted to share a nice one about finding bug duplicates. We all know that duplicate reports can be a big problem and one of the promises of ALERT is to make it easier to find the duplicates, tidy up our bugzilla and help developers get on with the more important stuff: fixing bugs and writing new features. f you have Flash enabled, you should see the video above (unfortunately there isn’t a free format version at present). UPDATE: Theora versions are appearing on the ALERT website now. You might need to click through to my blog if you’re reading on the planet. It’s best viewed full screen to see what’s going on. The duplicate matching code is being worked on, but has shown some promising results so far. There’s plenty more to do – our next meeting of ALERT is in early July where we’ll be spending some time making sure that the software meets the end user (free software community) needs. I’ll report back on the progress after that.